Right pulmonary artery (RPA)-to-left atrial (LA) fistula is one of the rare causes of central cyanosis. Untreated cases may suffer from hyperviscosity syndrome due to chronic hypoxemia, brain abscess, systemic thromboembolism, or cerebrovascular accident. , There are nearly 60 cases of RPA-to-LA communication reported in the literature. Management of these cases comprises surgical ligation of the fistulous tract or transcatheter closure by using a device or coils. , We report the successful closure of an RPA-to-LA fistula by a transcatheter trans-septal approach using a duct occluder in a child with severe cyanosis. A six-year-old child was referred for the evaluation of cyanosis and dyspnea. On examination, there was severe cyanosis (SpO 2 : 68%) with grade III clubbing. Examination of the cardiovascular system revealed normal heart sounds and no murmurs. Chest roentgenogram showed homogenous opacity noted in the right hilar region. Electrocardiogram showed no abnormality. 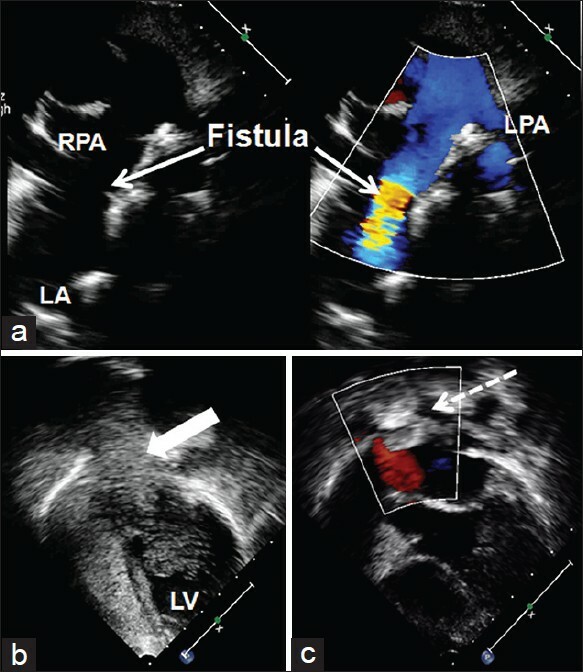 Transthoracic echocardiogram (TTE) showed communication between RPA and LA [Figure 1]a in high-parasternal short-axis view. Bubble contrast study confirmed the shunt between RPA and LA [Figure 1]b. A computerized tomography confirmed the large tortuous communication between RPA and LA [Figure 2]. The child was planned for transcatheter closure of the RPA-to-LA fistula after informed consent, under intravenous general anesthesia. Access from both the femoral veins and right femoral artery were obtained. An angiogram was performed to profile the RPA-to-LA communication [Figure 3]a. A 5F multipurpose catheter (Cook Inc, Bloomington, IN) could be easily negotiated from the RPA to LA through the fistulous communication. Balloon sizing was done using an 18 × 40 mm Atlas More Details balloon (C. R. Bard. Inc, USA) due to nonavailability of low-profile compliant balloons [Figure 3]b and the narrowest diameter measured was 18 mm. The widest diameter was at the RPA and appeared suitable for transcatheter closure; hence, it was decided to close the fistula from the LA side. Trans-septal puncture was performed using a pediatric Brockenbrough needle and Mullins sheath. A 0.032" angulated glide wire (Terumo Medical corp., Somerset, NJ) was advanced into the LA and snared using a gooseneck snare (ev3 Endovascular Inc., Plymouth, Minnesota, USA) leading to the formation of venovenous loop from the left femoral vein - RPA - LA - RA to the right femoral vein [Figure 3]c. A 9F delivery sheath was advanced over the glide wire from the right femoral vein across the interatrial septum and then through the fistulous tract from LA to RPA. An 18/20 mm duct occluder (Heart R, Lifetech Scientific, Shenzhen) was selected to close the RPA-to-LA fistula. The retention disc of the device was positioned on the floor of the RPA and the remaining disc released in the fistulous tract. 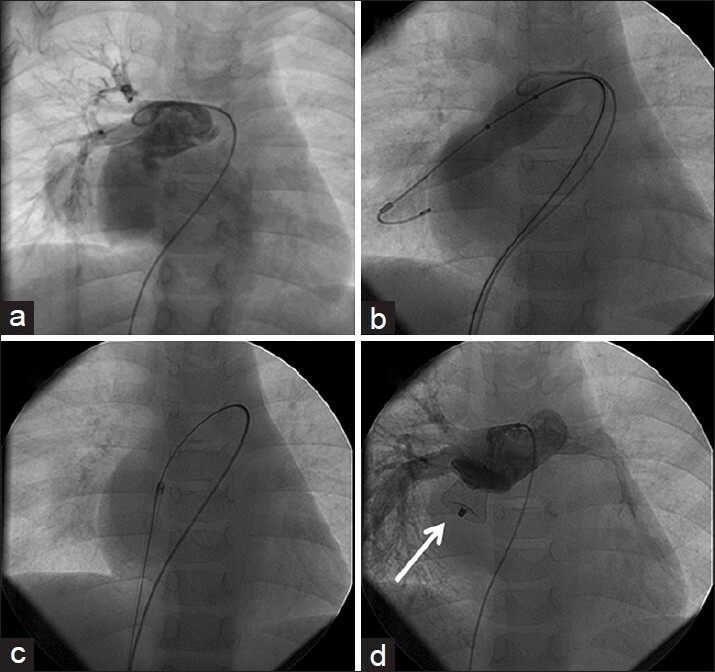 A selective RPA angiogram showed a well-positioned device and no residual leak [Figure 3]d. The systemic saturation improved from 68 to 96% immediately after closure of the fistula. There were no procedure-related complications. The child was observed for 48 hours prior to discharge, and was asymptomatic at a follow-up after six months. Presentation of direct RPA-to-LA fistula ranges from mild to severe central cyanosis, exertional dyspnea, or rarely a complication of right-to-left shunt when presented later in life. De Souza e Silva et al. described three types of RPA-to-LA fistula based on its opening site. In type I, RPA branches and pulmonary veins are normal but a fistulous channel connects the RPA to LA. In type II, the right lower pulmonary vein is absent and the lower lobe RPA branch drains directly into the LA, as an aneurysmal sac at the insertion site of the right lower pulmonary vein. In type III, pulmonary veins drain into the abnormal channel that connects the RPA and LA as a fistula. Subsequently, the fourth type was added by Ohara et al., which is similar to type II where the pulmonary veins enter into the aneurysmal sac. Our case is a classic example of type II where the RPA opens into a chamber proximal to the LA. No definite embryological explanation has been described for the RPA-to-LA communication. Some hypothesized that this anomaly may result from a communication between the RPA and a primitive pulmonary vein and later the pulmonary vein would become incorporated into the wall of the LA, resulting in a fistulous connection between the RPA and LA. , An atrial septal defect is the most commonly associated intracardiac anomaly; however, pulmonary abnormalities include absence of the lower or middle lobe, right lung sequestration, and diverticulum of the right main bronchus, as have been reported in the literature. , We did not notice any such abnormality in our patient. In our case, the RPA-to-LA fistula is large and type II. The aneurysmal sac is directly communicating with the superior aspect of LA. We thought that forming a venovenous loop after the trans-septal puncture maybe ideal to position the sheath in the proximal RPA. , The duct occluder can be positioned easily on the floor of the fistula if we place the delivery sheath. The antegrade deployment from the right ventricle to the main pulmonary artery maybe an alternative method; however, only double-disc devices should be used. It maybe difficult to position the double-disc device and may compromise the distal RPA flow if the device is not deployed properly. The major advantage of the venovenous route is (i) to deploy the duct occluder and (ii) that it can be pulled as distally as possible to prevent distal RPA obstruction. We conclude that systematic evaluation and assessment can accurately diagnose an RPA-to-LA fistula. Choice of the procedure is usually determined by the anatomy and type of the fistula. Transcatheter closure using a duct occluder appears to be a good alternative. 1. Zeebregts CJ, Nijveld A, Lam J, van Oort AM, Lacquet LK. Surgical treatment of fistula between right pulmonary artery and left atrium: Presentation of two cases and review of literature. Eur J Cardiothorac Surg 1997;11:1056-61. 2. Alexi-Meskishvili V, Dähnert I, Ovroutski S, Hetzer R. Right pulmonary left atrium communication. A rare cause of systemic cyanosis. Tex Heart Inst J 2001;28:122-4. 3. Liu L, Wei X, Pan T. Congenital right pulmonary artery-to-left atrial fistula. Asian Cardiovasc Thorac Ann 2010;18:373-5. 4. Krishnamoorthy KM, Rao S. Pulmonary artery to left atrial fistula. Eur J Cardiothorac Surg 2001;20:1052-3. 5. de Souza e Silva NA, Giuliani ER, Ritter DG, Davis GD, Pluth JR. Communication between right pulmonary artery and left atrium. Am J Cardiol 1974;34:857-63. 6. Ohara H, Ito K, Kohguchi N, Ohkawa Y, Akasaka T, Takarada M, et al. Direct communication between the right pulmonary artery and the left atrium: A case report and review of literature. J Thorac Cardiovasc Surg 1979;77:742-7. 7. Castleman B, Kibbee BU. Case records of the Massachusetts General Hospital: Case 45231. N Engl J Med 1959;260:1180-6. 8. Reye RD. Congenital stenosis of the pulmonary veins in their extrapulmonary course. Med J Aust 1951;1:801-2. 9. Sheikhzadeh A, Hakim H, Ghabusi P, Ataii M, Tarbiat S. Right pulmonary Artery-to-left atrial communication. Recognition and surgical correction. Am J Heart 1984;107:396-8. 10. Tuncali T, Aytac A. Direct communication between right pulmonary artery and the left atrium. Report of a case and proposal of a new entity. J Pediatr 1967;71:384-9. 11. Francis E, Sivakumar K, Kumar RK. Transcatheter closure of fistula between the right pulmonary artery and left atrium using the Amplatzer duct occluder. Catheter Cardiovasc Interv 2004;63:83-6. 12. Ramakrishnan S, Shivdas S, Kothari SS. Trans-septal closure of a right pulmonary artery to left atrial communication. Catheter Cardiovasc Interv 2010;75:1096-9.